Just a few days of 2014 left now. Time to catch up and recount something of the past year. My blogs started off well in the Spring, then as the summer arrived I just never seemed to have enough time and the blog suffered. Time to fill in the gaps from Shetand Handspun's year. It was exceptionally busy however with several trips which made it harder to keep up with production. The Vararfeldur started in June is still not finished. It has progressed slowly and continues to grow slowly, but spinning and knitting work needed to take priority. June, July and August, is the main tourist season, and 'stay at home' time to see visitors to the Studio and there are always many interesting tourists from all over the world. An invitation from Norway to attend a Wool event in Bergen at the end of August saw 9 of us from Shetland spending a wonderful week there. Teaching Fair Isle and Lace knitting workshops, demonstrating and giving talks on various textile subject. We were given space for an exhibition and for sales tables as well. 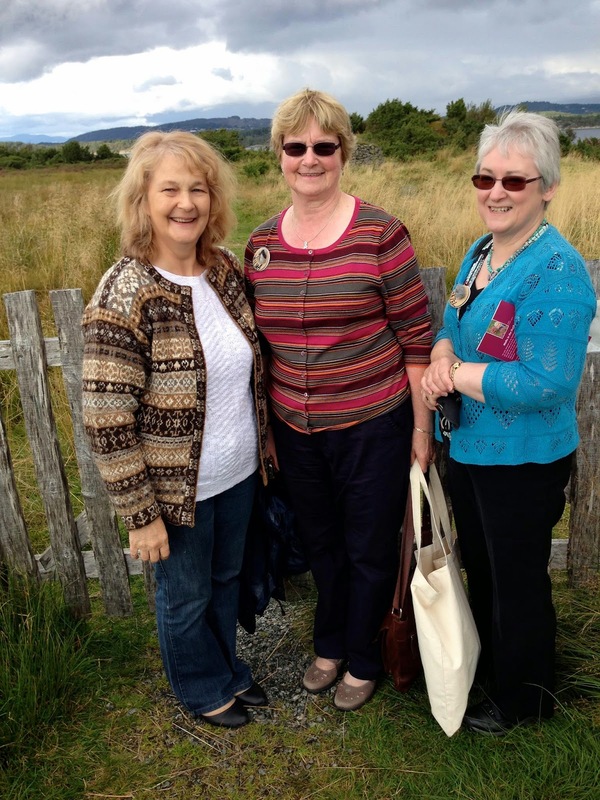 There were also trips to the Hillesvag Wool Mill and Oleana knitwear factory, and some wonderful food and company, (and a little bit of shopping too). A very successful week but my camera didnt seem to take any photos! (or I was having too much fun). 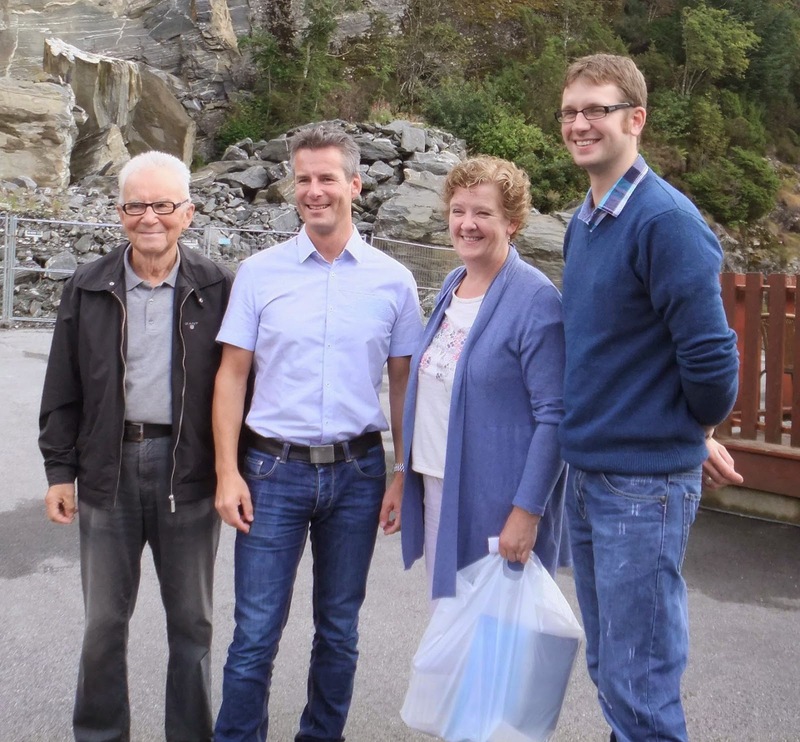 ... and this - 2 generations of owners of the Hillesvag Wool Mill, Norway with 2 generations of owners of the Sandness Mill, Shetland. Taken during our visit to the Hillesvag Wool Mill. 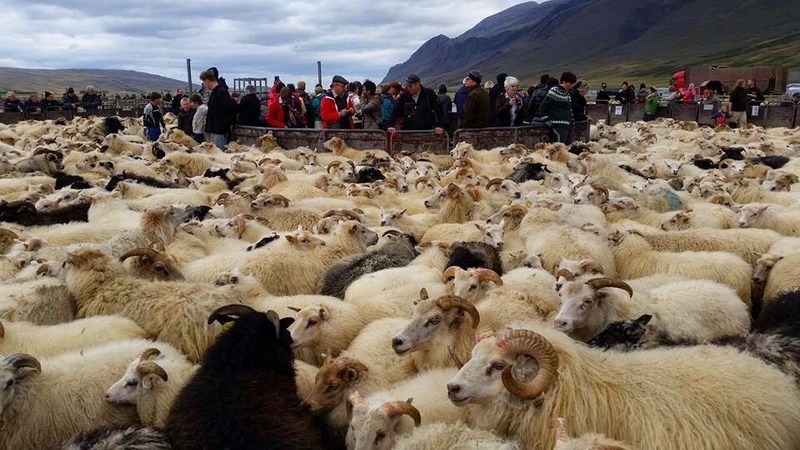 September took me to Iceland, and the North Atlantic Native Sheep and Wool Conference. 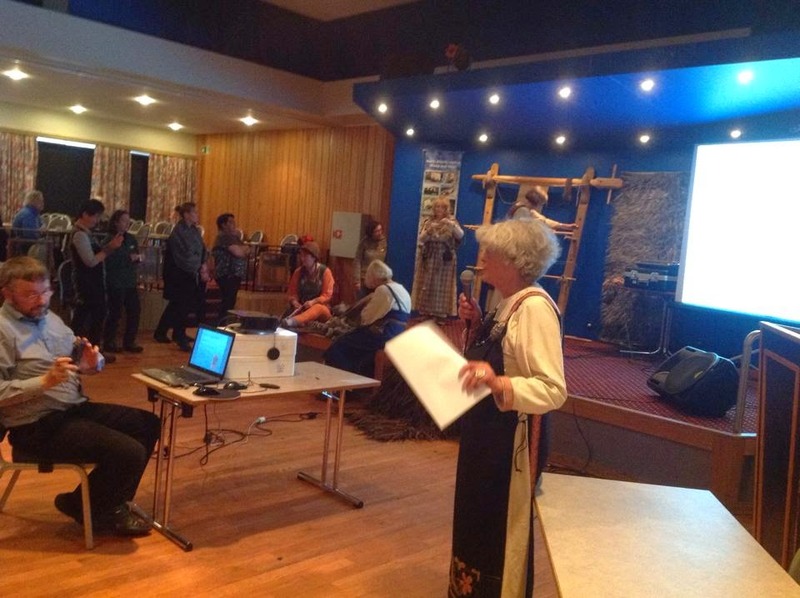 The invitation to talk was as a result of a project of ongoing research into the warp-weighted loom, - Hildur from Iceland, Marta from Norway and myself talked about native wool use on the old loom, each talking from our own countries aspect. We dressed in Viking costume and set up a loom which we worked on during the talks. With the help of an Icelandic and a norwegian viking spinning and weaving bands, we had a good tableau of textile product to accompany our talks. During Hildur's Icelandic talk, with Marta weaving and myself spindle spinning. We had a few excursions during the conference. This to see the sheep brought off the mountain ranges and watch them being sorted before all are taken indoors for the winter. Everyone got a gift of a mitten kit from the wool mill - this design aptly named 'Volcano' - and designed especially for the occasion of our visit. Apt as we were all in Iceland at the start of the latest eruption. Here is the first pair that was completed. Here are several photos from the Viking feast at the end of the conference - wonderful food and wonderful company. Looks like a good discussion at the top of the table. Lena from Sweden and Deb from the US - knitters are never idol. The journey back to the airport was across the mountains, with views of the glaciers, to see the terrain where the sheep have been all summer. No tarmac roads and desert vegetation, and near arctic weather now in september. But facinating to see. Here is a view from the bus. Home again, thankfully with no delays due to the volcano, with only a few weeks till Shetland Wool Week starts, and that would be 9 days non-stop both work and fun. Niela, from Niela Nel Studio, and myself, with help from a few others, put on workshops and drop-ins in the Hoswick Visitor Centre in Sandwick. Again too busy to take photos, but I did remember on one day only - so here are a few. Always need a cup of tea/coffee before we get started. My lace design class concentrating hard! Niela's dye class making very practical use of black rubbish bags as aprons - perfect. The drop-in area was well used all week whether we had a tutor available or not. There was a load of spinning done, then dyeing with logwood and cochineal...that can keep till the next blog. In the meantime I wish you all a very merry Christmas and a happy and prosperous New Year.